The solid Marvel swiftly is gorgeous!! The upload photos in the below post make these colours look very saturated and have my interest. These in store photos, not so much. I'll have to see them both in person. Maybe solid Marvel will be as nice as it seems but if I see it in person and do not love it, that will be fine. I just purchased the SS in black/marvel because I love the deep purple and am done buying swiftly LS (I purchased a few too many this winter to add some variety to my collection) but I love the regular marvel so much more and I will return if the SS comes out anytime soon. Do you think they're going to release a regular version of the marvel in a SS? @ anon 12:54 pm - I think there is a good chance. 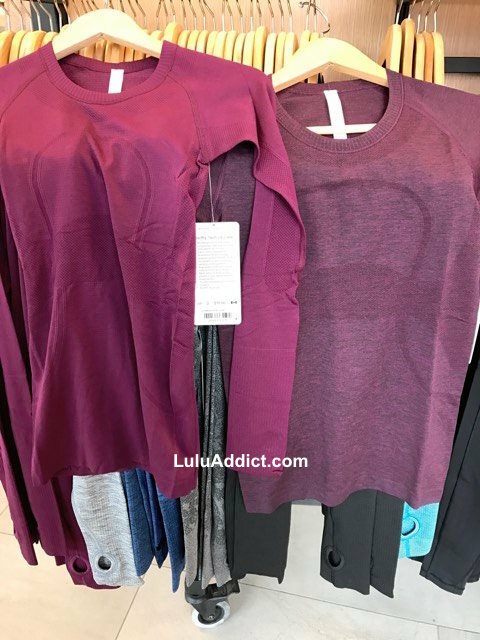 Lululemon did the same thing with the Midnight Navy swiftlys - had a solid midnight navy LS and the SS was mixed with black. A solid SS came out a few weeks after the black mix version so I'm hoping that will happen with Marvel, too. I just went into my local store to check out the colour marvel in real life. I was disappointed. It was a nice enough colour, but too close to other colours that have been released lately like plum, red grape, and others that I can't remember the names of. I agree the solid marvel swiftly is gorgeous. BUT it's spring.